Enucleation is the surgical removal of the eyeball that leaves the eye muscles and remaining orbital contents intact. Enucleation is performed to remove large-sized eye tumors or as a result of traumatic injury when the eye cannot be preserved. In the case of tumors, the amount of radiation required to destroy a tumor of the eye may be too intense for the eye to bear. Within months to years, many patients who are treated with radiation for large ocular melanomas lose vision, develop glaucoma, and eventually have to undergo enucleation. Intraocular eye melanoma. This is a rare form of cancer in which malignant cells are found in the part of the eye called the uvea, which contains cells called melanocytes that house pigments. When the melanocytes become cancerous, the cancer is called a melanoma. If the tumor reaches the iris and begins to grow, or if there are symptoms, enucleation may be indicated. Retinoblastoma. Retinoblastoma is a malignant tumor of the retina. The retina is the thin layer of tissue that lines the back of the eye; it senses light and forms images. If the cancer occurs in one eye, treatment may consist of enucleation for large tumors when there is no expectation that useful vision can be preserved. If there is cancer in both eyes, treatment may involve enucleation of the eye with the larger tumor, and radiation therapy for the other eye. Data from the U.S. National Center for Health Statistics estimate that nearly 2.4 million eye injuries occur in the United States annually. This report calculated that nearly one million Americans have permanent significant visual impairment due to injury, with more than 75% of these individuals being blind in one eye. Eye injury is a leading cause of monocular blindness in the United States, and is second only to cataract as the most common cause of visual impairment. While no segment of the population escapes the risk of eye injury, the victims are more likely to be young. The majority of all eye injuries occur in persons under thirty years of age. Trauma is considered the most common cause of enucleation in children over three years of age. For the year 2000, Texas demographics for cancer of the eye and orbit were fewer than five per 100,000. According to the Nilt, there are about 2,200 cases of eye cancer diagnosed in the United States each year. Following anesthesia, the surgeon measures the dimensions of the eye globe, length of the optic nerve, and horizontal dimensions of the cornea. The surgeon then illuminates the globe of the eye before opening it. A dissecting microscope is used to detect major features and possible minute lesions. The eye is opened with a sharp razor blade by holding the globe with the left hand, cornea down against the cutting block, and holding the blade between the thumb and middle finger of the right hand. Enucleation proceeds with a sawing motion from back to front. The plane of section begins adjacent to the optic nerve and ends at the periphery of the cornea. The plane of section is dependent on whether a lesion has been detected. If not, the globe is cut along a horizontal plane, using as surface landmarks the superior and inferior oblique insertions and the long postciliary vein. If a lesion has been found, the plane of section is modified so that the lesion is included in the slab. Enucleation may be performed under general or local anesthesia. In either case, the injection is given in the retrobulbar space. An antibiotic and an anti-inflammatory medication such as dexamethasone are also given intravenously. Because the eye is surrounded by bones, it is much easier for patients to tolerate enucleation than the loss of a lung or kidney. When surgery is performed under general anesthesia, patients do not feel or see anything until they regain consciousness. Additional local anesthesia is often given at the end of the surgery so that the patient will have the least pain possible when waking up in the recovery room . Most patients have a headache for 24–36 hours after surgery that is relieved with two regular headache medication pills, such as Tylenol, every four hours. A firm pressure dressing is maintained for four to six days, such oral antibiotics are given for one week; and steroids, as prednisone, adjusted according to patient status, are given three times daily for four days. The socket is evaluated after removal of the pressure dressing. If the edema has disappeared, the sutures are removed. Topical antibiotics are applied four times daily for four weeks. Enucleation surgery is very safe; only rarely do patients experience major complications. Complications include the following: bleeding, infection, scarring, persistent swelling, pain, wound separation, and the need for additional surgery. Complications may also occur with the orbital implants routinely used with patients who have undergone enucleation. Among these is the risk of infection. Within two to six weeks of enucleation surgery, patients are sent for a temporary ocular prosthesis (plastic eye). Besides the swelling and the black eye, patient features look normal. After a final prosthetic fitting, 90% of patients are usually quite happy with the way they look; 80% say others cannot even tell that they have only one eye. In a study performed by the National Eye Institute on melanoma patients, at five-year follow-up, 82% of the patients who underwent enucleation remained alive. At a 10-year follow-up, 31% remained alive. As of 2003, the study is still ongoing and will follow all patients for up to 15 years. There are no alternatives to enucleation because it is a procedure of last resort performed when other treatments have failed. Linberg, J. W. Oculoplastic and Orbital Emergencies. New York: McGraw-Hill Professional, 1992. Shields, J. A., and C. L. Shields. Atlas of Orbital Tumors. Philadelphia: Lippincott Williams & Wilkins, 1999. Tasman, W., et al. The Wills Eye Hospital Atlas of Clinical Ophthalmology. Philadelphia: Lippincott Williams & Wilkins, 2001. Vafidis, G. et al. Perioperative Care of the Eye Patient. Annapolis Junction, MD: BMJ Books, 2000. Adenis, J. P., P. Y. Robert, and M. P. Boncoeur-Martel. "Abnormalities of orbital volume." European Journal of Ophthalmology 12 (September-October 2002): 345–350. Burroughs, J. R., C. N. Soparkar, J. R. Patrinely, et al. "Monitored anesthesia care for enucleations and eviscerations." Ophthalmology 110 (February 2003): 311–313. Chantada, G., A. Fandino, S. Casak, et al. "Treatment of overt extraocular retinoblastoma." Medical Pediatric Oncology 40 (March 2003): 158–161. Gragoudas, E., W. Li, M. Goitein, et al. "Evidence-based estimates of outcome in patients irradiated for intraocular melanoma." Archives of Ophthalmology 120 (December 2002): 1665–1671. Jordan, D. R., S. R. Klapper, and S. M. Gilberg. "The use of vicryl mesh in 200 porous orbital implants: a technique with few exposures." 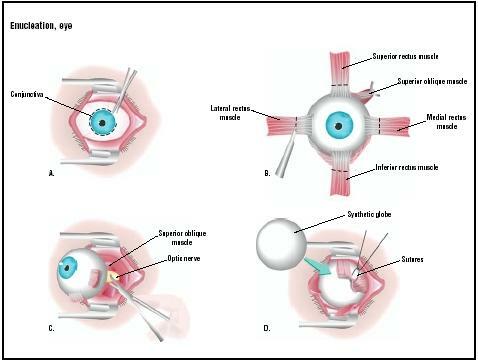 Ophthalmologic and Plastic Reconstruction Surgery 19 (January 2003): 53–61. American College of Eye Surgeons. 2665 Oak Ridge Court, Suite A, Fort Myers, FL 33901. (239) 275-8881. http://www.aces-abes.org/ . National Cancer Institute. Suite 3036A, 6116 Executive Boulevard, MSC8322, Bethesda, MD 20892-8322. (800) 422-6237. http://cancer.gov/ . Finger, Paul T., MD, FACS. "Enucleation." Eye Cancer Network. [cited May 5, 2003]. http://www.eyecancer.com/Enucleation/enuc.html . Eye enucleation is usually performed by an ophthalmic surgeon or an ophthalmologist in a hospital setting. Young and healthy patients may undergo the surgery on an outpatient basis but most stay in the hospital for at least one night after surgery. Ophthalmic surgeons are members of the American College of Eye Surgeons, and are certified by the American Board of Eye Surgery after submitting to an extensive written application. Before ABES certification, they must be certified by the American Board of Ophthalmology (ABO). This certification indicates successful completion of an approved residency program and acquisition of sufficient knowledge in the areas of medical and surgical ophthalmology. How many enucleations do you perform in a year? How much time will I need to recover from the operation? When can I get a prosthesis? Hi, glad I read this article and got to see a diagram of the surgery. I lost my right eye to an infection. I woke up on March 9th. and 80% of my vision was gone. I had a terrible headache, but I didn't know what was happening. The next morning I woke to find a Hypopian in that eye and I went to the ER, right away. The next morning I had surgery. Unfortunately, this infection I had moved so fast that I was completely blind within a month and a half. And now because the eye looks horrible and I have a lot of pain, I am going to have the eye completely removed (Enucleation) on June 4th. This article had good information and answered most of the questions that were in my mind. Thank you. I think the information was informative. I am one of the few who eye area is sunken and don't like the way I look as I did before. Actually I think I looked better with the bad eye. Insurance or Blind service will not help me. They think I look fine. But they are not me. Do you have any suggestions? I am not adjusting just existing and hiding. Good article. I am looking for the CPT codes that would be apprpriate for enucleation and also cost of a prosthetic eye. I would appreciate any information you can provide. for Downloading to MS Word. The purpose of this data is to assist in the evaluation of a recommendation to have this type of surgery compared to Eviseration surgery if feasible. The surgeon will assist in the decision based on the info and my ability to withstand. I wil also forward this info to other interested parties. I am glad that resources like this exist. When I was 10 I was in the way of a rock that was shot out from a lawn mower. My grandfather was a retired opthamologist so my hand was held through all 13 of my surgeries, with finally no option but Enucleation. My life has moved on amazingly and happily, but I've struggled with the lack of first hand memory and education about what I actually experienced (young bliss, right) and my grandfather has since passed. I know how I got to where I am at but not from a slightly, if at all, educated position. I like to think that I've adapted both physically and mentally but still have moments of fear. I was raised to accept and whenever possible enjoy it all. I am 25 now and now scared that the doctors who have held my hand the whole time will age before me. What happens then? And is this a normal fear? Or is it even a fear worth acknowledging? I just had enucliation last Friday, May 6. I was told I would feel down for a couple of days when I still have pain across my nose, eye, face and top of my head I was given oral antibotics and eye antibotics and will be oing back to the doctor in 3 days. He was looking for shingles but did not find any rash, but after reading about shingles there are a few patients that do not get the rash. Have you had any experience with patients getting shingles after this type of surgery ? I have glacoma, and has had 2 cornea transplants and both of them rejected and I am blind in my left eye, can only seea shadow and my eye has very servere pain from time to time which is hard to bare. A gritted feeling. If I close the bad eye my good eye seems to see better. I am suppose to go to the doctor about removing the eye and getting a plastic eye. I want to know if there are anybody out there that have had this done for the same reason and if so how did it go. Hi, I guess I am in the beginning of all this, I currently have an "optic nerve sheathing" mengenoma(sorry for spelling) tumor, which I did raditation 2 yrs ago, which has stopped the growing. Earlier this year, I woke up with a swollen eye and later at the ER, was told I had a mass on the back of the eye, which was later diagnosised as cancer. Further test revealed that it is a reoccurrance from the breast cancer and that I am one of the few that this happens to. I then had to incur another round of radatation knowing that I would probably go blind in the eye. Now for the past 2 + weeks, the pain has increased almost 200%. Is this normal? And what else can I expect? You know the stuff the docs dont tell ya, because they are waiting for you to tell them. Please don't leave me in the dark! I am 73; I lost sight in my left eye due to diabetic retinopathy when I was 37. Lately my iris is losing its color--a whitening. I'm afraid I will end up with its continuing and end up looking like a freak. However, I have no medical reason such as a tumor, for removing my eyeball except cosmetic reasons. I'm afraid no surgeon will remove my eyeball for cosmetic reasons. I don't know if I could just pay for the operation myself. What can I say--I am so depressed. I live in Pittsburgh and would welcome any suggestions. I don 't want to seem frivolous, but I've had diabetes since I was 7 and have been through the wringer. I want to know the percentage of enuclation done in India and in the World per year? All this info can be very helpful. What worries me, more than the surgery or risks, is the cost. i feel somewhat at piece with get my eye getting removed. I'm some what of outdoors person and sometimes i find my self doing labor work. I'm not an emotional person so i can deal with depression when it comes. The reality for me right now is that of a kid wishing to continue his studies, to be able to work out with out having to worry the pain, or having to try study and focus when my eyes can't focus. My reality is that i don't want my parents to worry about me. They need to stay focus on my sister college expenses and my little brothers well being. So,if anyone can help me and tell me how much i need to safe up in order to get my eye removed. P.S. i don't have insurance and i'm 21 wish a not well pay job. I want to know how to stop blleeding which can occur after removal of eye and i want also to kno if the optic stalk can be closed if yes and which type of suture materioal can be used . I suffered blindness in my left eye on Dec. 28, 2011 following routine surgery for retinal detachment. I contracted pseudamona bacteria during same day surgery and eight days later had additional surgery. This was at Morristown Memorial Hospital in Morristown, NJ. I had two subsequent surgeries at New York Eye and Ear Hospital, NY, NY to remove scar tissue. I am totally and forever blind in that eye and have suffered infections, copious tearing, break down of the skin around my eye. Last week the scleral buckle meant to keep my eye centered and intact slipped off and stared to protrude out from under my eyelid. I had to have a nerve block in my face and had surgery in the Dr.'s office to remove the scleral buckle. Today, I am seeing a plastic ophthalmologist. The eye needs to be removed. My understanding is that during surgery, cadaver sclera will be implanted into my head, an artificial prosthesis will be placed in the eye, and the conjunctiva will be used to cover the eye. When I open my eye, I will see gunk and pink. I have already suffered, as we all have, the tortures of the damned. My question is this: How long is the recovery? I am still working full-time and only have 17 sick days left. Please be as honest as possible and let me know how long you were out of work. Many thanks. Just had eye removal surgery 12 days ago after having radiation plague therapy two years ago. I had lost the vision in my left eye from pressure about two months ago so the transition has not been difficult. The pain was very minimal---much less than the radiation. An ocular prosthesis is in place and I will receive the front part in a few weeks. Not sorry I took this step. Life is pretty much back to normal. I had enucleation surgery on Sept 4, 11 days ago. I am taking pain medication as prescribed. Am having a lot of pain in the eye. Is this normal? What could be causing the pain? Should I be alarmed? I would like to know what is the cost of a removal of the eye? My dad lost his right eye due to a severe infection in both eyes. Dr said he will need to have it removed soon but we never thought this soon. Their afraid he can get an infection where his eye is dying and the infection go to the brain. His left wasn't damaged much but is scarred from the infection and the abrasion he had in it. I know he will need a cornea transplant so he can see better. My main concern is how much is the cost of the enucleation? If anyone can help out with any info it is greatly appreciated. I had enucleation of my right eye 4 months ago. Am still without a temp prosthetic due to "persistent swelling". Am on a one month use of the conformer, trying to reshape the globe inserted at surgery. Any comments from fellow sufferers? more prevalent in different light. When I shut my right eyelids tightly, the "haze" disappears. My brain is trying to get signals from my right eye and reacts to the right eyelids being closed. I also have had sinus issues on the right side - from low grade, long term infections to pressure when the barometer changes (I can predict snow and rain :)!!!). I have had some crania-sacral sessions which relieved some of these issues; I also am starting to do nasal washes. Hoping to keep sinuses clear and improve breathing on right side while reducing/eliminating the almost constant drainage and throat clearing. Anyone else have this challenge? I had my left eye removed due to an airbag exploding in my face. It cut my cornea and caused a rare infection to set in. After seven months of the most viscious pain i ever felt they removed it on march 4th 2016. I just got my prosthetic eye and as soon as i got it it is draining some kind of mucus. I feel i may be allergic to the prosthesis. Not sure but i am going back to the doctor tbat removed it to find out. Also i been having some psychological issues with this. Is that normal? Ill find out soon enuff. Joel - yes, it's normal to have some psychological or emotional reaction to losing an eye. It's like losing a limb, but more noticeable, and hard to adjust to since we use our eyes to make eye contact. It's also harder on people who lose their sight suddenly and have to adjust to monocular vision. Unlike me, I've been blind in my left eye since birth, but even so, I still had some emotion in losing a part of me. The drainage should stop after a while. Ask your ocularist. If there are air pockets in the socket, they can fill up with fluid. They should be able to fill these in. But also, just having a foreign object in the eye can cause the mucous glands to react. Once the conjunctiva has completely grown over the implant (which can take 3 - 6 mons, from what I've heard), this should reduce the mucous production. I'm 11 weeks post-op enucleation and should have my prosthetic eye by the end of next week. I had a derma-fat graft and currently have constant drainage - a combo of mucous and bloody-tinged fluid. I'll be happy when this subsides! I was born blind in my right eye. A year ago i had it removed though to pain. I was in surgery for about an hour or so. I was released the same day. A few days later i had complications. The eye socket was swelling severe pain and fever. The doctor told me that I wouldn't have pain anymore. Well a year later now I'm still having pain. I had to get my prostatic eye removed thou to the pain. My doctor has absolutely not given me no answers to why this is still happening. I had have CT scans and MRI done yet there is no evidenced off any abnormality. A 19 year old shouldn't be going through this. This article is great it has given me loads off information. I lost my right eye when I was 6 or 7. I have learned to adapt and overcome a lot of most of the complications associated with eye removal. I,unfortunately have been suffering from horrible headaches since then. I am 50 yo now and have been to several doctors and have several tests only to be told that there is nothing wrong. Does anyone else have this problem? I had my left eye removed 10 days ago after being diagnosed with choroidal melanoma. I considered this to be my best option as I was told that due to the size and location of my tumour, I would lose my central vision. Also, the ongoing affects of radiation can be detrimental to the rest of the eye. My surgeon was brilliant and I have suffered no pain or bruising and I have no regrets about choosing enucleation. I am looking forward to my temporary prosthetic eye in 5 weeks time. I'm having enuculation surgery in a couple weeks and i'm looking for some answers if possible. How long did it take to recover? were you able to return to work right after since I've read that it is an outpatient surgery or will possibly spend either 1 night in the hospital.